So here’s the deal. I upload my 600-word article on my WordPress dashboard, use the proofreader to make last-minute corrections, and then publish. Fifty seconds later, my phone beeps; so-and-so liked your post. I’m a slow reader, but even if you’re a pro at speed-reading, you could not have read my blog post that fast. Haba! The ‘numbers’ game, no longer holds the same fascination for me as it did two years ago when I started blogging, and yet, I’m in awe of the numbers. The number of people who engage my posts by liking, commenting, sharing, or leaving a message via my contact form is one way I measure the effectiveness of what I do—entertain, inform, inspire, or provoke thought. I cannot ignore the numbers. When someone stumbles on my blog, he may not know what to read. If the Top Posts & Pages widget on the sidebar does not woo him, the number of likes and comments may resolve his indecision. In that sense then, a fake like is better than no like. One evening between 8:42 and 8:44, my phone throbbed with the force of too many notifications. After the climax, so-and-so had liked nearly fifty of my blog posts. I was not flattered. It is like a man telling me how intelligent I am while staring at my chest; it just doesn’t add up. Okay, I understand that sometimes a like on WordPress is like a poke on Facebook. It’s another way to say hello or get your attention—oh boy; that was one long poke! It is an invitation to come out and play, which I honour by visiting the Liker’s blog, as time permits. It is not an indication that so-and-so has read and digested your writing. Hmmm, very well then. But there’s a nagging ring of deceit to this thing, this game of like tag. So far, I have been unwilling to like a blog post that I did not read or appreciate, as if my like has a price tag, as if anyone would know. 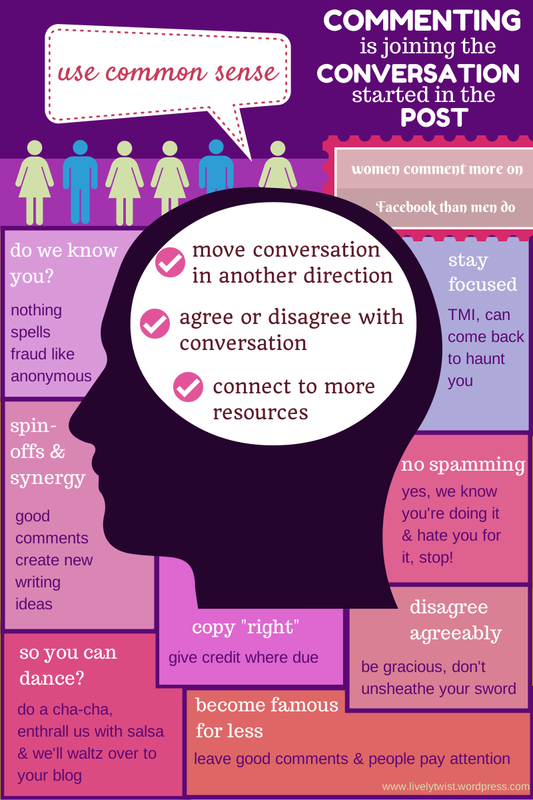 If quality feedback is important to a blogger, then this promiscuous liking distorts perception; it certainly feeds ego. In a way, social media is about numbers, number of likes, comments, follows, and shares, because no one wants to have a conversation by himself. The problem with the like button on some social media sites is that the conversation with others may be illusory. This post would have been unnecessary but for an encounter on WordPress, involving likes and follows. After reading a blog post I enjoyed, I liked it. In response, the blogger who only recently followed me informed me that a like without a corresponding follow was an insult. See me see wahala. Are we now back to high school? 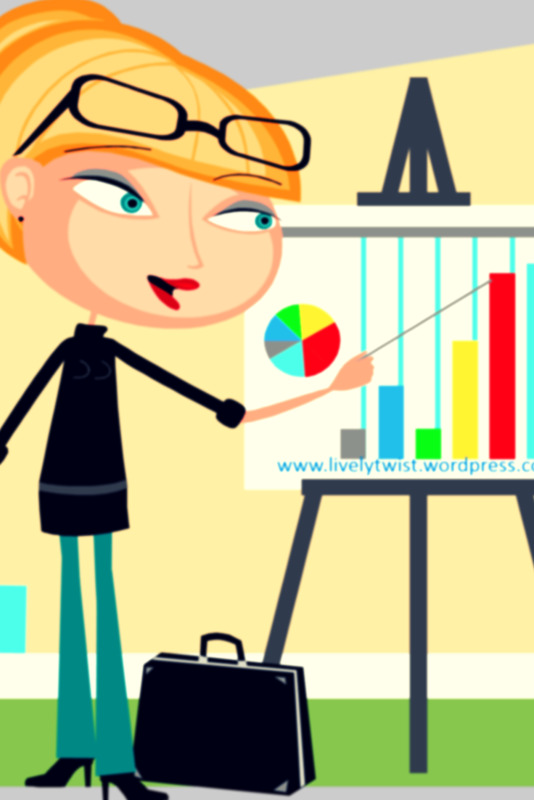 Following a blogger on WordPress means that new posts from the blogger will appear in my Reader or I will receive an email notification when they publish a post. It seems dishonest to have my Reader flooded with hundreds of posts, which I will not read, but like. To me, a follow is a commitment to read your posts. I am commitment shy. In a world awash with information, but limited time, you and I cannot read every blog post. If yours is a niche blog about DIY, for example, it would be spurious for me to follow your blog because I don’t like DIY and don’t want to get better at it. Perhaps I will throw this textbook idealism out the window to monetize my blog or market any book I may write in future. Time will tell. First-world problems, heh? Still, the highest compliment I could pay you isn’t necessarily to follow you, but to read and engage your writing. It is the highest compliment you could pay me too. I am drawn to my WordPress stats page at least once every day although the stats do not tell me things I am curious about like how old my readers are. I know a twelve-year-old girl who reads my blog occasionally and a man of fifty-one, who claims to have read everything on my blog. Are the rest of my readers older or younger? My stats do not also tell me if I have crossed gender barriers with my pen. Who reads my post more, men or women? I know no one in Brazil and Azerbaijan is a place I must locate on a map, yet my words have gone where my legs could not go. My words have travelled over Congo, a place I visited in Wilbur Smith’s The Dark of the Sun, and touched down in the United Arab Emirates. At least one person in every continent, in 105 countries, has viewed my blog. I have heard it said that Nigerians don’t read, and that the average Nigerian’s appetite for literature lies in entertainment (Nollywood gossip), politics, and religion. I think I have done my part to debunk that claim. 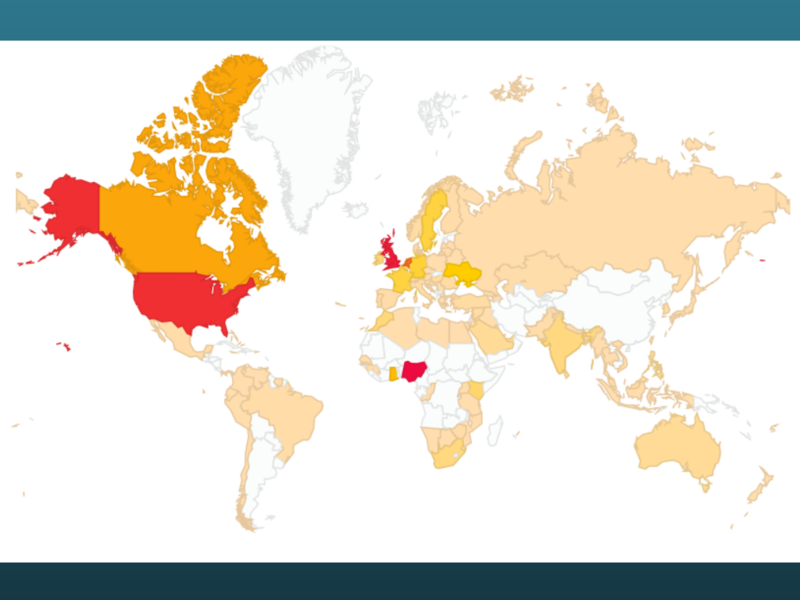 My highest blog views are from Nigeria, closely followed by the United Kingdom and the United States. Mind you, nearly 5,000 views in a country of 150 million people is a drop in the ocean, but I’ll take that drop, thank you! What brings people who I have never met to my blog? I’d like to think that although I don’t know what gnaws on your mind at night, my words do. 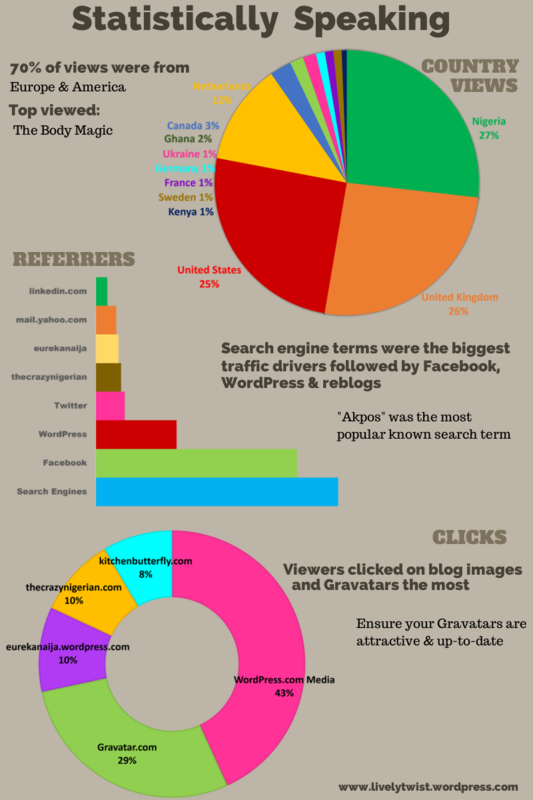 More likely, search engine robots pull you to my blog when you search for words like Akpos or Body Magic. If Akpos is unique to Nigeria, then majority of the seventy percent of viewers from Europe and The Americas are Nigerians. It makes sense as my Naija experiences colour my metaphors, making me feel proud that I’m also exporting Naija culture to non-Nigerians. 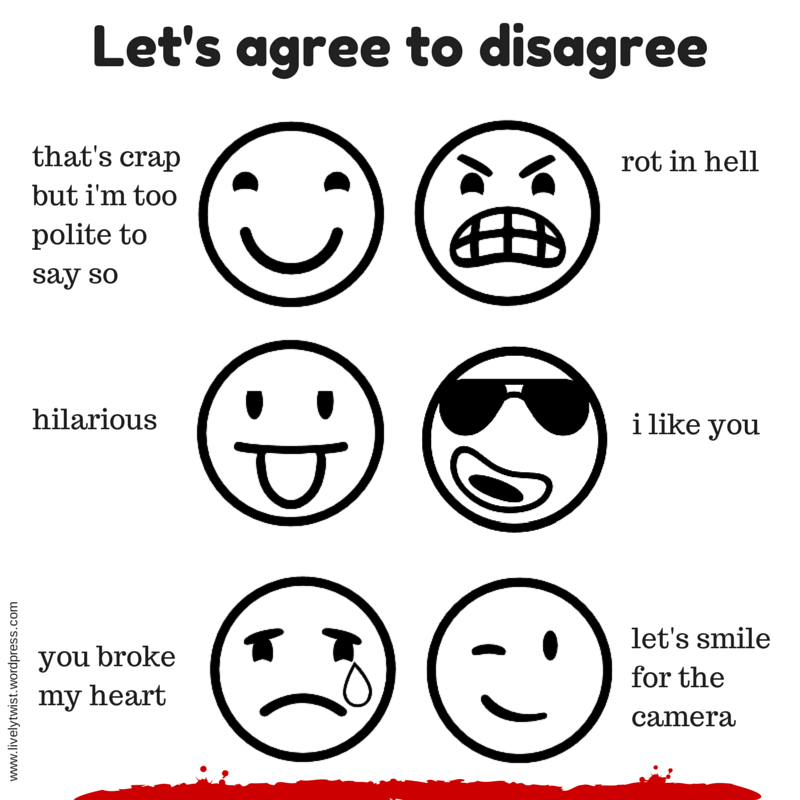 Was it my smiling Gravatar or a comment I left on another blog that brought you here? If so, I’m never changing that photo! If Facebook brought you here, I am not surprised for people share my posts on Facebook more than on any other social media platform. I wonder if you stay after you land on my blog or if you leave, bookmark the page, and return later. If you stay, what do you like to read most? When I read a book, I try to find someone I know or myself in its pages. Is the protagonist’s failure like mine or is his success worth aspiring to? Does he walk with a limp so I can catch up with him? I think the best stories are about the human condition, which would explain why stories about my or another’s insecurities served with wit, are the most viewed, most shared, most commented, and most liked posts on this blog. Posts like The Body Magic, I am not Looking for Love, I am going to Work, The Measure of a Man, Any Comments, and Six Degrees of Separation. Perhaps vulnerability exposes authenticity that makes you stay beyond the polished prose. Now I know what drives traffic to my blog, do I write another Akpos post? Now I know which posts attract the most views, comments, likes, and shares, do I stop writing posts like, Grow Up Mikey and Our National Pastime, because they performed poorly at the box office? I cannot confine myself to the prison of writing for stats; my mind is bigger than that. However, I realise that my stats are my friends and they are relevant to the degree that I can make right inferences, which affect my writing and ultimately enhance your reading pleasure. So please fill in the gaps and tell me what my stats page won’t: who are you, what brought you here, and what will keep you coming back? Any Comments? No, I think I’ll Pass. Today, the spotlight is on you! As I reflect on my blogging journey, I realise that engagement is a big part of the fun for me. Why have you decided to blow out my candles before the MC counts to three? Following my informal survey, I’ve compiled a list of reasons why you don’t comment and given my tongue-in-cheek arguments against them. Find your excuse and tell me if your arguments are louder than mine are. 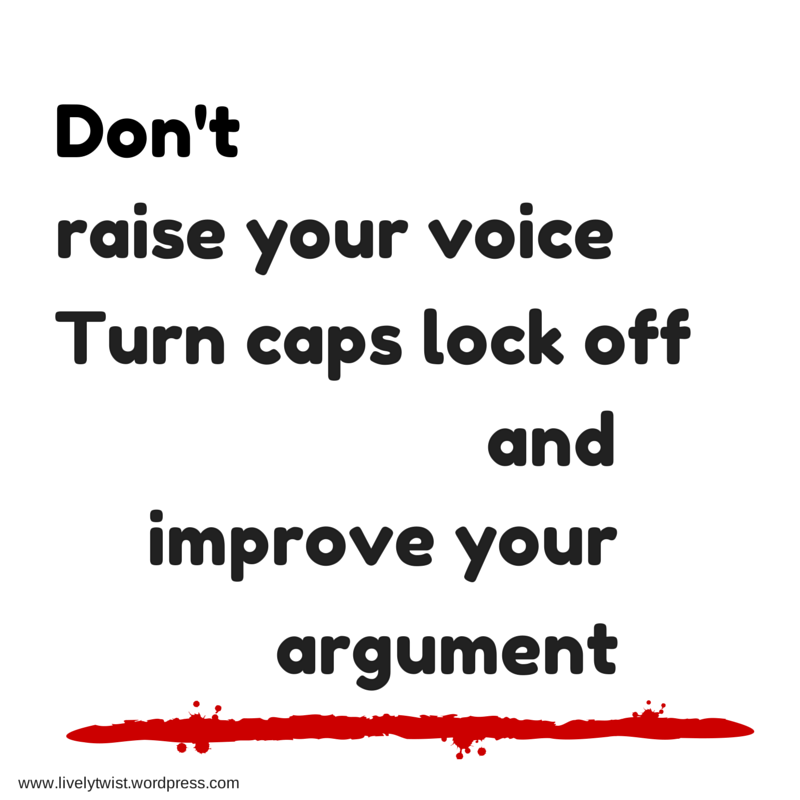 You claim that you want to see what others are saying and where the conversation is going before you add your voice. In other words, you don’t want to be the first to comment. You surprise me. Are you incapable of independent thought? Monday to Friday, you make decisions like an entrepreneur without a board. Is it only when you come to Livelytwist that you cease being a pioneer? They told you the internet is a dangerous place and now you take everything you read with a pinch of salt. You worry that future employers are googling your name. You worry that when you become a presidential aspirant, a comment you left on Livelytwist can and will be used against you. Hmmm, what do we know for sure? Y2K didn’t happen and aliens are yet to take over our world. Unconvinced? Leave your comments with a grain of salt; call yourself Panteka Monleka, who cares? You were planning to, but you forgot. Committing things to your memory is like fetching water with a basket. No time like the present. Stop this minute and go to the comment box. Write about the sea or the prevalence of memory loss in Homo sapiens living in the Twitter Generation. You know what; don’t sweat it before you forget again. 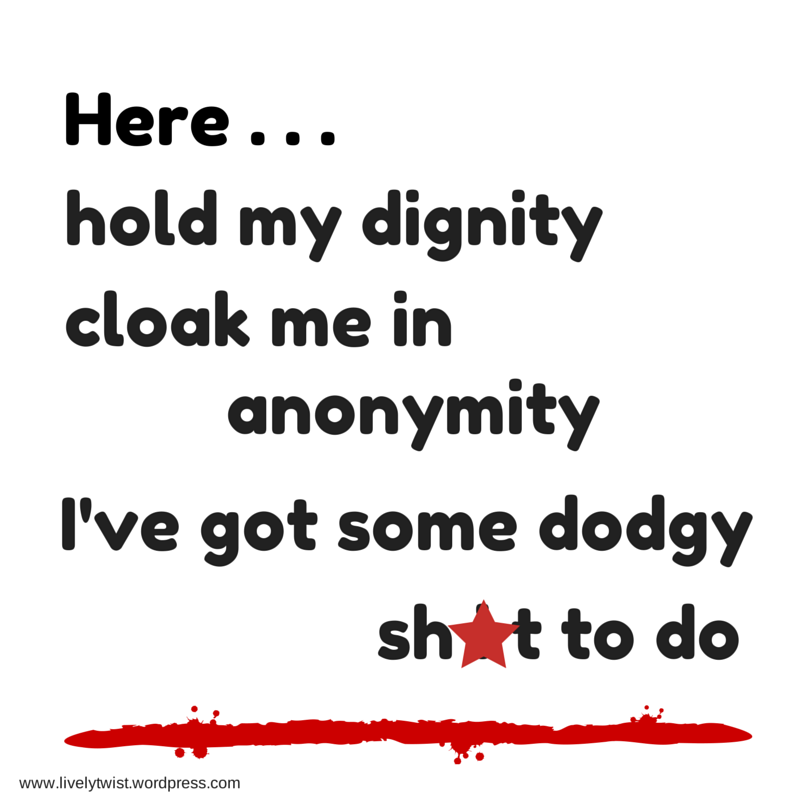 Just write, nice post, and know you have done your good deed for the week. My “grammar” intimidates you. You don’t want to sound like a fool. Really? Did I set an English exam for you? Do you not have spell check? 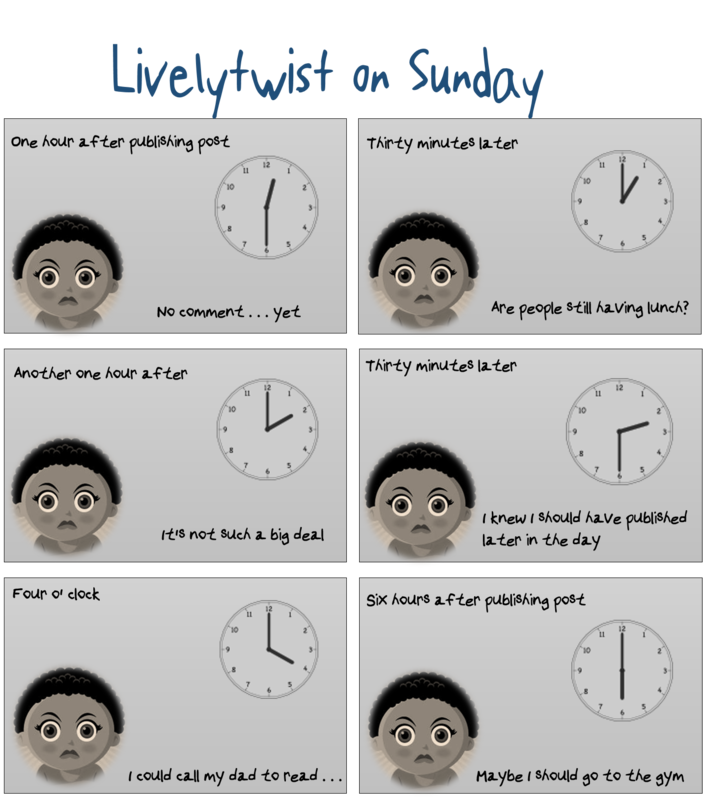 Is it not true that since you began reading Livelytwist, your writing has improved? You’ve stolen a metaphor here and a paragraph there, basked in accolades, and didn’t mention my name. Meanwhile, you shared The Measure of a Man, with that boy who showed you pepper and when he didn’t say sorry, you read Happy New Love and rekindled hope. Yet, not a comment, not even one comment. Timi, you go girl! Oh yes, I can soar on the wings of your private messages and clinch the Nobel Prize for literature! You say although you do not comment, you’re supporting me from behind. Ah, I can manage my behind myself. Please move to the front. For your sake, I posed questions at the end of posts to foster engagement. You ignored the hint and sent me yet another BBM: Timi you go girl! Get ‘em tiger! Where did you find a smiley clothed in animal skin? Never mind that, just leave a comment please. “Lol, this was so funny, I’m in stitches. Y’all need to read this!! 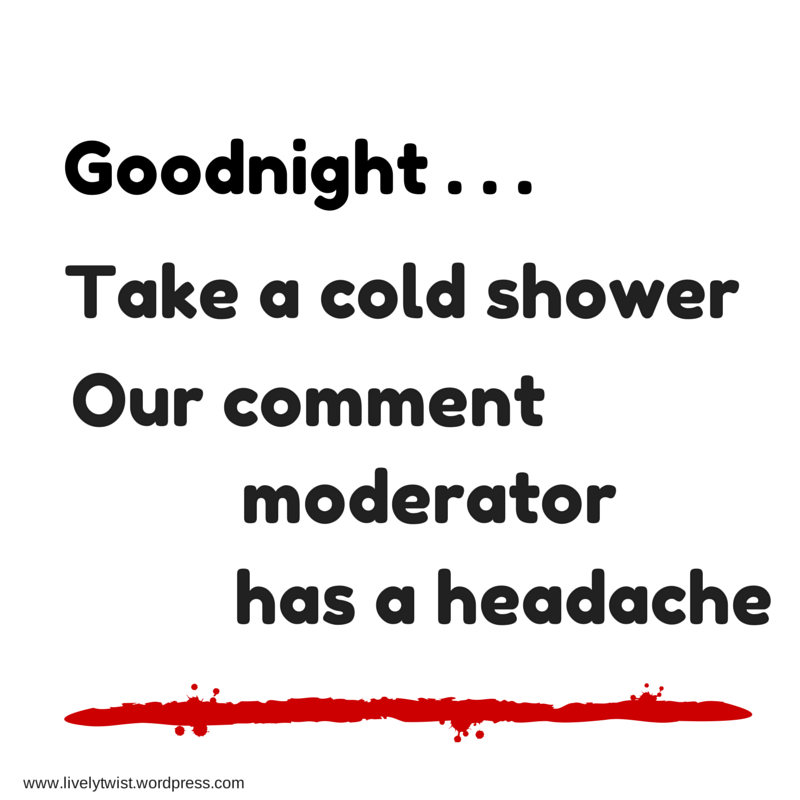 !” If you’d left this comment on my blog, this post would’ve been redundant. Instead, it was what you wrote as you shared my post on Facebook and Twitter, while counting the minutes until the end of the second service at your church. I am grateful that two people heeded your call. Did you know one of them left a comment? You’ve almost earned your badge. 140 characters or less gets a pass mark in my book. I’m waiting . . .
You have promised to comment by God’s grace. Your one argument trumps my thousands. No network. Enough said. Scores, Livelytwist: zero, Naija Pally: one. Non-commenter, I could go on, but hearing from you is more important.